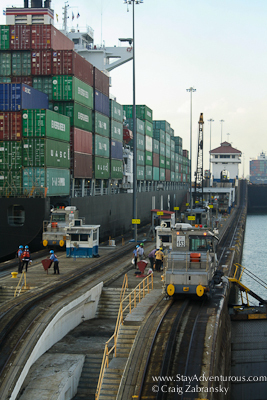 Passage through the Panama Canal is on most maritime travelers’ bucket lists. And now after a recent cruise through the Caribbean I can check it off mine. The canal itself is impressive, very impressive. 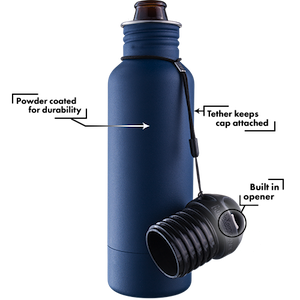 It is a modern marvel approaching 100 years operation still with its original locks. 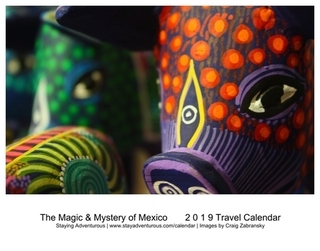 “Panamex” compliant cruise ships (a max of approx. 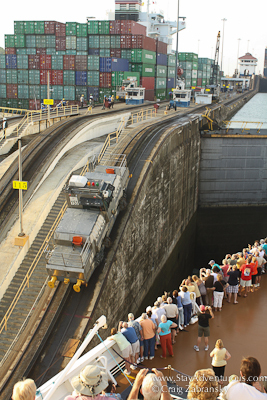 960 ft long x 106 ft wide) offer passage to tourists as it is not just for cargo transport anymore. 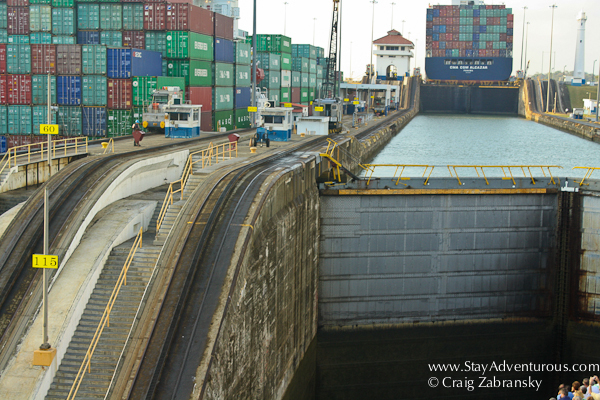 On my passage through the Panama Canal I listened to on board presentations took an excursion to visit the Gatun Locks, and paddled across Lake Gatun on a kayak. I even had the opportunity and assisted in interviewing the Captain Emiel de Vries of the ms Zuiderdam (my Cruise Ship) about the passage. All amazing. 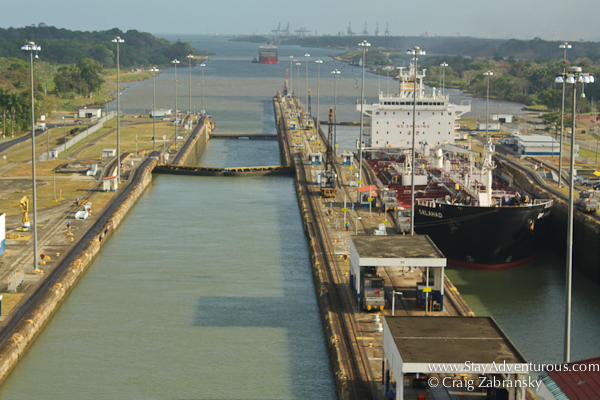 But there is no substitute for experiencing the canal firsthand via passage on a ship. No substitute for standing there on deck soaking it all in. I hope these pictures give it justice. 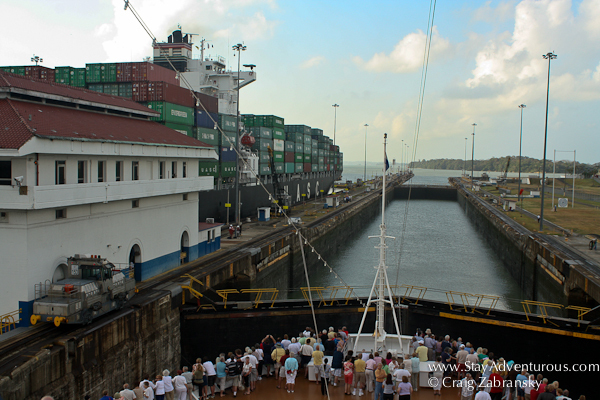 On my partial passage from the Caribbean side, near Colon not Panama City, the Cruise ship passed through the three Gatun Locks en route to Gatun Lake. Early in the morning, this was my view. 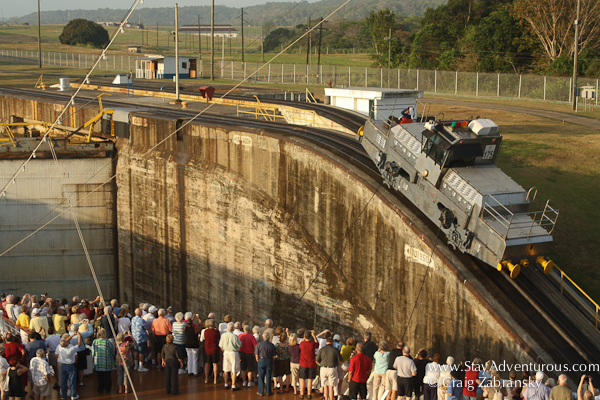 The electronic locomotives known as Mules (or Mulas) are used to keep the ship straight in the canal locks. They don’t propel the ship forward just steady the ship in the tight locks. Looking back always provides a chance to reflect and appreciate what has happened. 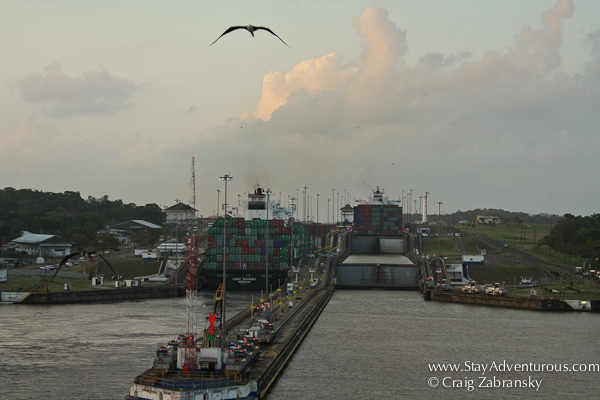 On this day, I passed through the Gatun Locks of the Panama Canal. It is an experience I’ll always cherish. 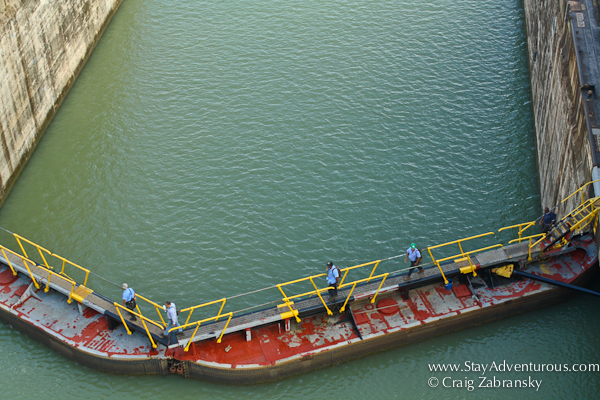 I’d like to thanks Cruise Radio and Holland America for passage aboard the ms Zuiderdam through the Panama Canal. . Thanks for showing me something I may never get to see in person. Amazing in many different ways. Mary, I agree, it was amazing in so many different ways… exactly. This is on ma bucket list.. yes, I have a FEW! Great pictures of the voyage through the Canal. You are right, you appreciate it so much better when you see it first hand. It is an awesome accomplishment. So true… there is something special about being aboard a ship on passage… it truly was an amazing experience and accomplishment. Beautiful set of photos! Good article! I had the opportunity to go through both ways, back in 1991 when I was working as a crew member on sailing yachts. Thanks for being back memories with this great post & photos! I’ve heard so much about the construction of this canal—it was a monumental human feat and a lot of lives were sacrificed to make this happen. Wow, what a momentous journey! These are some seriously cool pics. 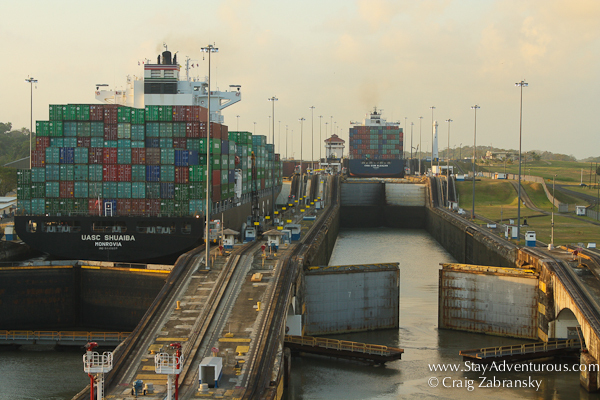 That is a goal of mine as well to cruise through the panama canal. Definitely do it… It is impressive.